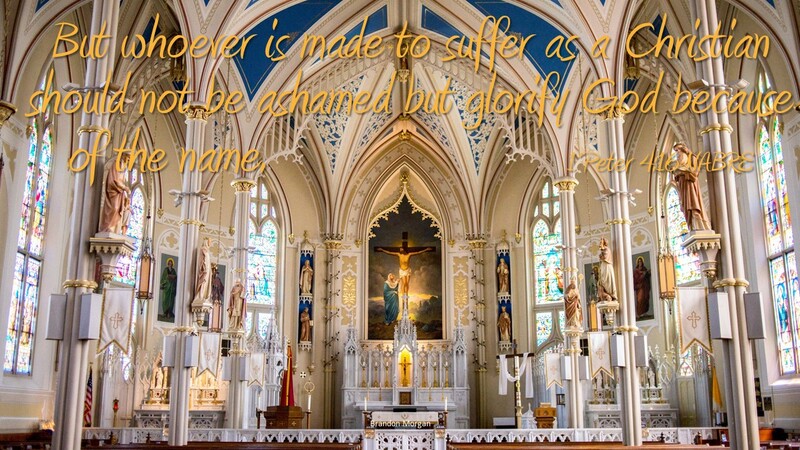 Peter in chapter four of his letter speaks about suffering, how it joins the sufferer to Christ. We read Christians are being persecuted for their belief in Christ by pagan and gentile people. It seems an odd way to fortify and encourage the community of Christians by telling them they will suffer. But Peter compares it to Jesus suffering. How Jesus suffering became an act of redemption for all. Jesus accepted whatever pain and suffering was thrust upon Him to show God will do anything for those He loves. I heard it said that there is absolutely nothing that can be learned from success after the age of thirty. After thirty all growth, all learning, all transformation happens when we suffer an ordeal and come out the other side. Generally speaking it is through suffering God gets our attention and we discover the need for God in our life. For Peter and the early Christians much of this suffering came at the hands of persecution for following Jesus. Christians today are still challenged. We have experiences in church that tends to make insiders and outsiders. Churches can be places where people belong by looking at those who don’t belong and admiring their own superiority. Church people have decided big pretty buildings honor God; with money to air condition, cut the lawn, keep a maintenance staff. Yet Jesus message is “every one of you who does not renounce all his possessions cannot be my disciple.” (Luke 14:33) Has the church become the place with the possessions that church people work to uphold. Suffering comes from insiders who are like the gentiles in Peter time, they maintain the structures of church rather than the message of Jesus. What do you think of those not churched? How can you reach out to others?